...we absolutely loved it! I'd have to say it was the single most memorable place we stayed anywhere in Southeast Asia, and that means a lot, considering all the awesome places we enjoyed in several countries there. South Korea boasts homes, available for short-term rentals, built in the traditional hanok style that arose in the 14th century. Hanok construction typically features traditional design, with its ondol floor-heating system, and a system of wings built around an interior courtyard. The buildings are considered environmentally-friendly, and are built with materials available in nature, such as wood (for the floors, frames, and doors), stone, straw, clay, and paper. Since floors are kept warm in the winter, most inhabitants prefer to sit and sleep on the floor, on mats. This is just one of the reasons that taking off your shoes is required, before entering someone's home in Korea. The hanok where we stayed featured a modern bathroom, with a his and hers side. Each had Western-style toilets and a shower stall with hot water. 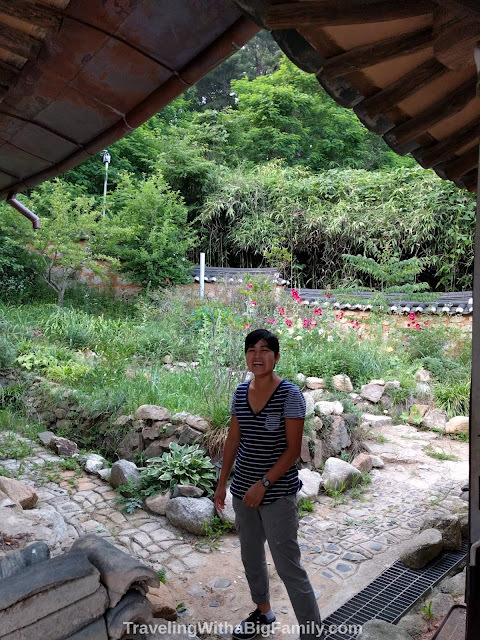 The bathrooms were added in recent decades, but these had to be installed in a nearby, but separate, structure (just a few steps away) in order to preserve the traditional look and nature of the hanok. Hanoks are regulated, so you won't see satellite dishes, swimming pools, or car garages attached to them. These hanok stays aren't going to cost the same as a hotel, but we found it was a worthwhile splurge, due to the sense of history and place that we could experience by staying here. There are many choices for hanok stays in Seoul itself, such as in the Jongno-Gu district. You can find hanoks in the historical preservation neighborhoods known as the Namsangol Hanok Village and the Bukchon Hanok Village. The Bukchon Hanok Village is situated perfectly between major historical attractions: you have the Gyeongbokgung Palace and the National Folk Museum of Korea just a few blocks to the west, and the Changdeokgung Palace and Gardens are just a few blocks to the east. Unfortunately we didn't venture that far into Seoul, but it's definitely on our list for the future. 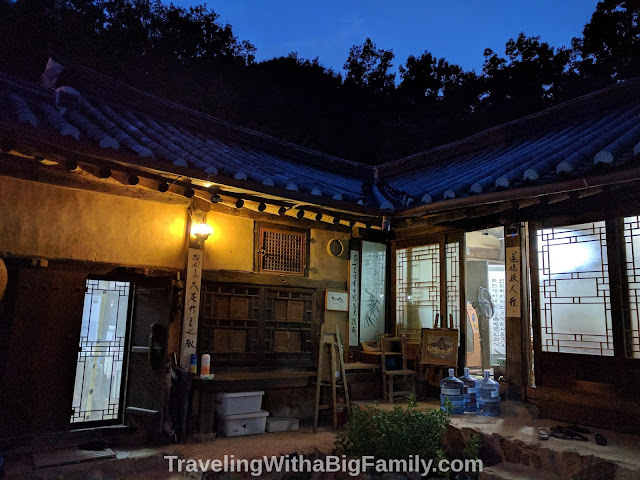 Of course, Seoul is a solid hour from Seoul's international airport in Incheon (up to 2 hours at rush hour), so if you're planning on staying closer to the airport (which we would recommend, if you're only in-country for one night), then we'd recommend searching for a hanok right there on Yeongjong island. This is the same island as the airport, in the vicinity of Eurwang-dong or Yongyu-dong. Even though they are only a few minutes from the airport, this area can be surprisingly rural, preserving, with the exception of automobiles and wi-fi, some taste of what traditional life there would have been like many years ago. 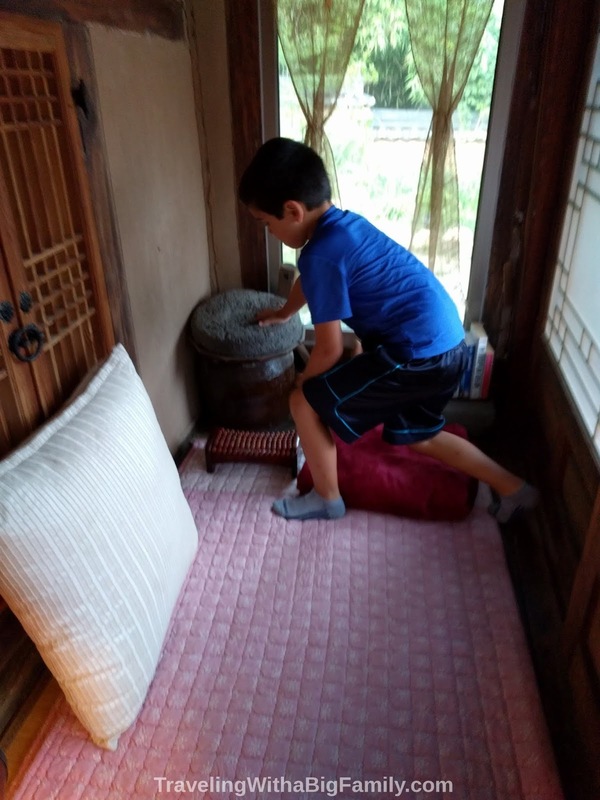 On our return to the U.S. from Southeast Asia, we stayed on Yeongjong Island in a hanok home, built in 1890, in the style of the 14th-century traditional homes. Due to the way they are built, a typical hanok room is built to accommodate perhaps 3 to 4 persons. 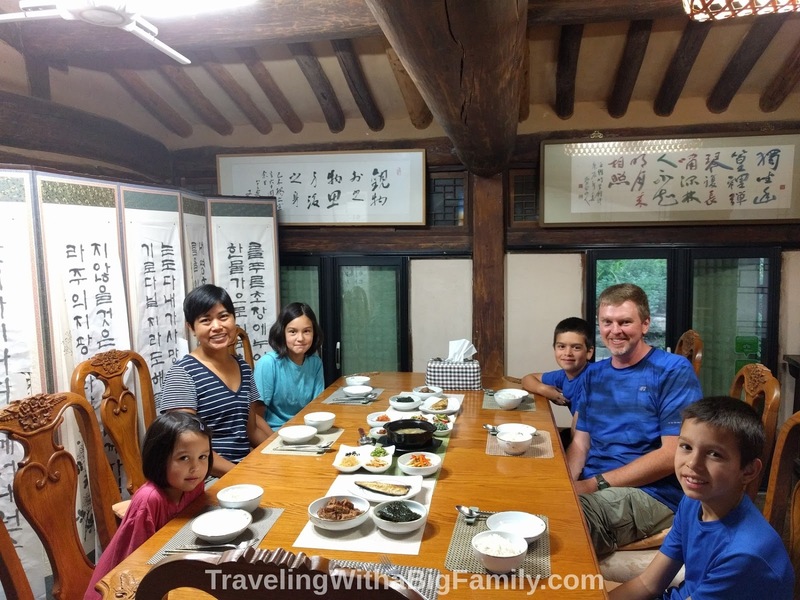 We found it extremely tricky to locate a hanok stay option that was big enough for our family of 6. The structures are quite large, but, in many cases a family lives there and they rent out only one or two of the rooms of their home at a time. The one where we wanted to stay near Incheon airport had only a space big enough for 3 people, maximum. So I contacted the host and asked if there was any way to accommodate 6 people, assuring her that some of us were quite smallish and didn't need much room. I was pleasantly surprised to learn that she actually had 2 wings available for rent. One room would sleep 3 and the other could sleep up to 4. These were listed separately on the rental platform, and usually had different people (not traveling together) occupying the 2 units. She didn't have any listings for 6 or 7 people, even though she could comfortably accommodate that many all at one time. Fortunately, although she is often booked solid, she had both wings available when we needed them. So we booked one room for the boys and a second room for the girls. We had access to our two rooms, plus an interior courtyard with picnic table, a large living area with dining table, a kitchen and game room, and a sitting area with a nearby reading nook. Most hanoks I researched get guest ratings that are off the charts. I've seen solid 8's, 9's, and 9.9's out of 10 in every single one I've checked in South Korea. Where we stayed in Incheon, the host was wonderful. We enjoyed chatting with her before and during the trip, and felt we made a short-term friend, even though it was just a quick stopover for one night. She wasn't intrusive at all, but was very friendly and inquisitive during our drive to and from the hanok. 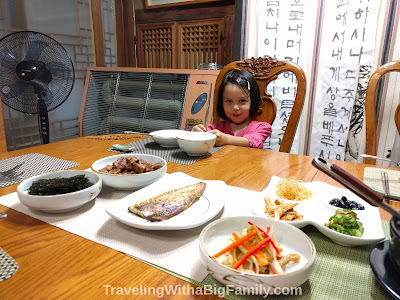 Our host also offered (for a modest additional charge) to prepare for us a traditional Korean meal, which her mom actually cooked. It was a great meal. We got to experience a dozen kinds of food we wouldn't have otherwise even seen or known about. She also included a free English/American breakfast, with lots of options for cereals, oatmeal, bread, fruit, etc. We got to try a couple of fruits we had never heard of. This is the sort of place that leaves a notebook out for guests to sign in and leave their comments. The kids also loved the reading nook. The home also provides access to many board games and books in English which you can borrow. There are a handful of loaner bicycles too. Oh, and airport pick-up and drop-off was also included! It was a great stopover, thanks to our wonderful host in Incheon. Ideally, we would have devoted at least 2 nights to our hanok home stay in Incheon, perhaps even 3. This would be long enough to get a good feel for what it's like living in this space, and would also be long enough to explore the surroundings at a leisurely pace. If you'll be staying in Seoul, I'd say 3 nights would be a good start, because you'll have your choice of a dozen magnificent cultural attractions (plus all the famous shopping and nightlife Seoul is known for). 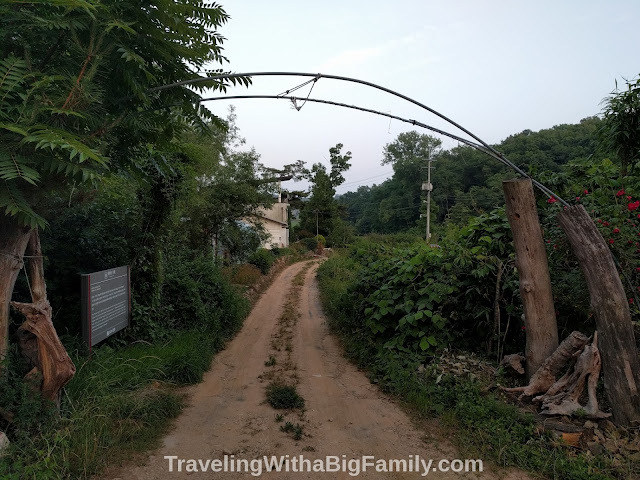 If you'll be staying in Incheon like we did, a longer stay would give you time to walk down to the beach and through the surrounding countryside full of rice farms. When staying in South Korea it is helpful to have some Won (local currency) on your person. We encountered several situations, in both of our brief visits to South Korea, in which the only possible way to pay for a service or a purchase was in Won (debit/credit cards were not accepted). For instance, if you're paying for a meal, you might have to pay in cash (in Won). If purchasing a small handicraft or souvenir from a hanok home, Won might be the only way to pay. Watch your head when you go through the doorways in a hanok home. But don't worry, if you forget, like I did, to duck, the pain will teach you. Other than that, these places are perfect for a big family! 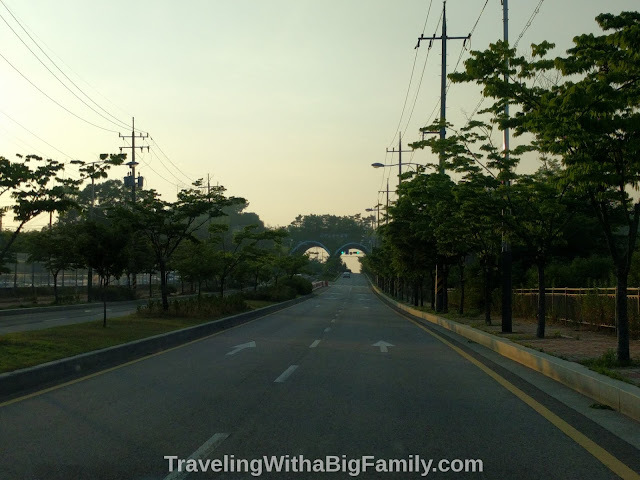 For our 10 Tips for Taking Advantage of a "Layover Loophole" in Seoul, check out this post.